Good tacos, incredible craft craft beers, awesome DJ's, quirky games, karoake, prizes and more. Adults only. Best deal in town... $2 tacos go til 9pm. $20 buckets on a nice range of Colonial Brewing Co beers & cider go til 10pm and then $7 per beer for the rest of the night! The tacos are solid and these crafty beers are award-winning yumminess. So get there early for all the amazing specials and dress up. Doors open at 7pm. Star Wars theme but dress Star Wars or Mexican or both. Why also Mexican? Well the next day is Cinco de Mayo and it's a time-honoured tradition for many Americans to celebrate a Mexican holiday that most Mexicans don't actually celebrate. 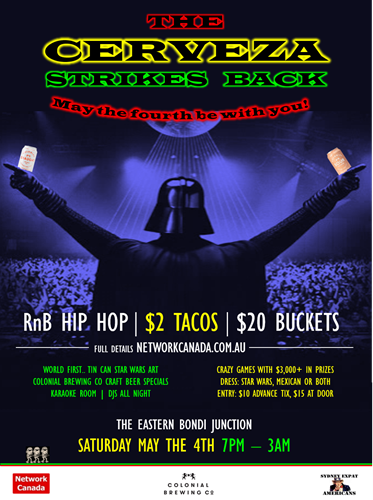 We're taking over all of El Topo Basement Nightclub at the Eastern Hotel in Bondi Junction. It's 100m from Bondi Junction Train & Bus Stations. Fyi this is the biggest annual Star Wars theme party in the world!